For a long time, the conventional wisdom was that our DNA is fixed; whatever genetic characteristics we were born with are the traits that will characterize us throughout our lives. While DNA changes do occur, we have thought that they occur only very slowly—over millions of years, like the evolutionary changes that enabled small-brained primitive primates to develop into homo sapiens. This means if we were born with the genes that predispose us to heart attack or obesity, we are doomed to be fat and short-lived. Not true. Or rather, it is true that the DNA we were born with doesn’t change, but it turns out that DNA isn’t the whole story. A new field called epigenetics has shown that lifestyle and conditions you are exposed to in life can change how your DNA is expressed—and those changes can sometimes be inherited by your offspring. Epigenetics refers to heritable changes in the “wrapper” of proteins that surround the DNA. It does take many generations for the genome to change, but the epigenome can be changed by the addition or subtraction of a methyl group. A good analogy is that DNA, or the genome, is the hardware (hard to change) and the epigenome is the software (easy to change). A methyl group is one carbon atom attached to three hydrogen atoms. When a methyl group attaches to a specific spot on a gene, it can change how the gene is expressed; it can dampen the gene’s effect or turn it off–or it can turn a gene on or boost its effect. This process is called DNA methylation. So where do the Swedish chickens come in? In 2007, researchers at the University of Linköping in Sweden created the henhouse from hell, designed to stress the chickens that lived in it. The experimenters manipulated the lighting, causing the chickens to lose track of when to sleep, when to eat, and so forth. The discombolulated birds demonstrated a significant decrease in their ability to negotiate their way through a maze to find food. When the chickens were moved back to a non-stressful environment, they conceived and hatched chicks that also demonstrated poor skills at finding food in a maze—even though they had never been stressed. The research went on to demonstrate that the mothers’ exposure to stress had resulted in a gene expression that the chicks inherited. The chicken experiment is only one of many animal studies that have proved the validity of epigenetic theory. Another study, this time focusing on human beings (coincidentally, Swedish humans), also proves the point. In the 1980s, a preventive health specialist, Dr. Lars Olov Bygren, studied the effects of feast and famine years during the 19th Century in a remote population of people living in northern Sweden. He wanted to see if there were long-term effects, not just on the people who had experienced the feast or famine years, but also on their children and grandchildren. Bygren discovered that people who had gone from normal eating to over-eating during the times of overproduction produced children and grandchildren who lived significantly shorter lives than those whose progenitors had endured famines. So what does this all mean to us on a day-to-day basis? Epigenetics is a new science, and while the human genome has been mapped, the human epigenome has not yet been fully deciphered. 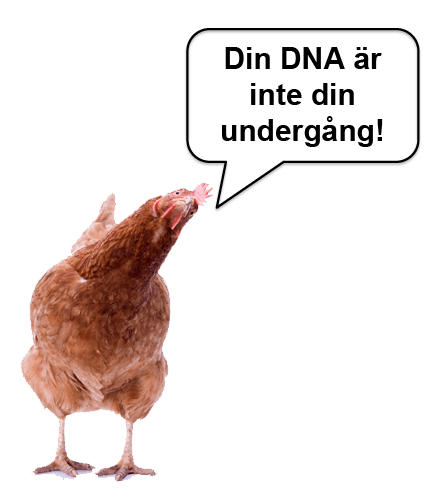 We don’t really know enough to be able to say, “Do this” and “Don’t do that.” But we do know—thanks to the Swedish chickens and people—that stress and nutrition play major roles in epigenetics. Elevated cortisol levels can retrieve triglycerides from storage and relocate them to visceral fat cells (those that lie under the muscles deep in the abdomen), causing the fat cells to grow. Cortisol can also stimulate appetite and craving for high-calorie foods. This is because the body’s logic tells it that if you are under threat, you need to keep the calories coming. So reducing stress can have a positive effect on weight loss, especially if you follow a reasonable regimen aimed at losing weight gradually over a long period of time. Weight lost quickly via crash diets merely triggers the body’s cortisol mechanisms, resulting in the yo-yo weight loss/weight gain cycle we all know so well. This entry was posted in Change your behavior, Change your brain, Heart Rate Variability, Stress, Weight Loss and tagged Beat Healthy, beathealthy, chickens, cortisol, crash diets, diet, dieting, DNA, epigenetics, epigenome, gaining weight, genetics, genome, health, heart disease, heart health, heart monitor, heart rate, heart rate variability, heartbeat, HRV, meditation, mhealth, mobile app, mobile health, mobile monitoring, new paradigm, qi gong, quantified self, stress, stress reduction, Sweden, SweetBeat, SweetWater Health, vital signs, weight loss, yoga on May 12, 2012 by sweetwaterhrv.